Mary's puppy love: is it the hat? Please do not link directly to photos in this blog. For fellow recreational royalty watchers on other non-profit blogs and forums, you are welcome to give a link to the blog, but we ask that you re-host­ photos and give credit to the blog. Mary is accompanied by Dorte Thing (rear left), commercial advisor at the Danish Embassy on her visit to the Excel Exhibition Centre. Crown Princess Mary is visiting London to take part in a business and cultural mission to promote Danish business intitiatives and cultural events. The visit includes the opening of the Vilhelm Hammershøi exhibition at the Royal Academy of Arts in London. Unlike the more exploratory visit to New York last year for Creative Nation by Frederik and Mary, this visit to the U.K. is in support of a more established market. The U.K. is Denmark's fourth largest export market and with a Danish population of about 40,000, London boasts the largest Danish community outside Denmark. 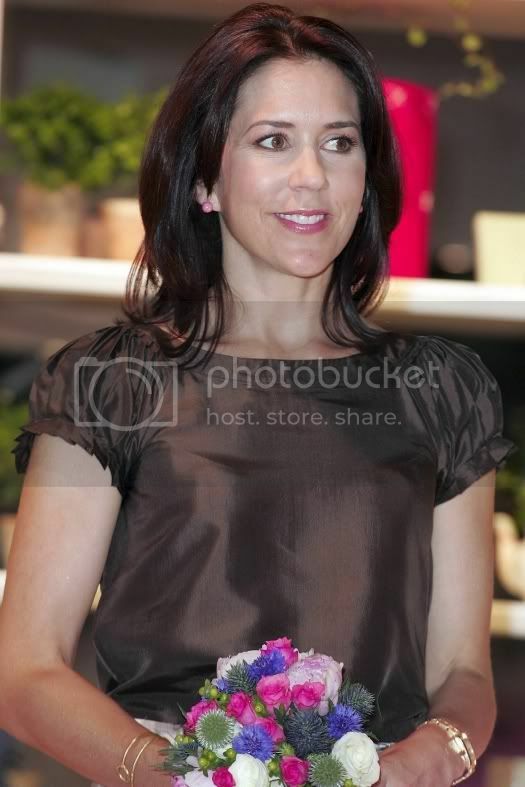 Her Royal Highness Crown Princess Mary of Denmark visited Summer Fair today to support the Danish Federation of Small to Medium Size Enterprises (DFSME) and Danish designers exhibiting at the show. 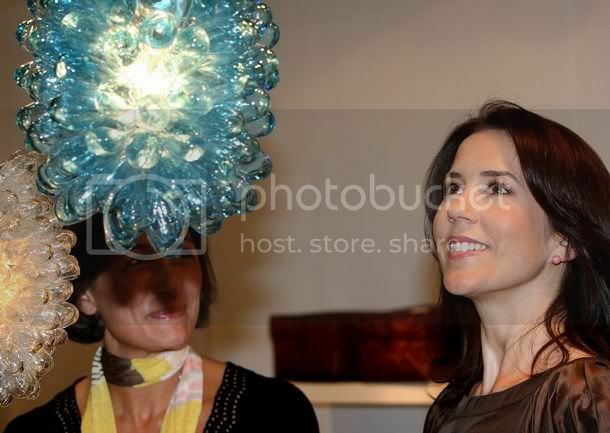 The princess spoke to each exhibitor in the 95% Danish group of stands and accepted a gift from their collections. Jah/Bag co-owner Charlotte Buskbjerg said they had given the princess a goat skin jewellery box for her daughter and a red leather handbag with yellow flowers. She said the princess was particularly interested in the handbags Jah/Bag had produced in collaboration with Danish artist Jusse Volander. Fabric Copenhagen owner and textile designer Annette Egholm selected a velvet bag from her newest collection to give to the princess, which she said was gratefully received. The princess also complimented Egholm on the colours in her product range. The supplier's logo, a portrait of the last crown princess of Vietnam became a talking point as the princess commented on how beautiful she was and said that her father in law was especially fond of Vietnam as he had lived there as a child.